This 36" square gas fire pit works well with deep seating furniture frames as well as linear sectional furniture frames. Available in 12 finishes and 13 different porcelain tiled tops, this American Made gas fire pit creates a focal point that can casual or elegant in any outdoor space. 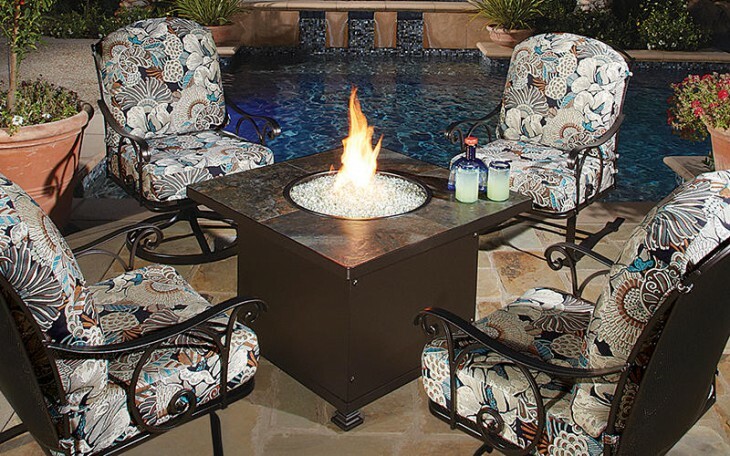 Place the matching lid on the burner and this gas fire pit doubles as a table. Further customization of this gas fire pit can be attained by choosing a standard iron rim or a hammered iron rim. Available in Chat Height (24"). BTU ratings on this gas fire pit start at 40,000 BTU's. This fire pit is fueled by a 20 lb. propane tank and natural gas conversion kits are available.